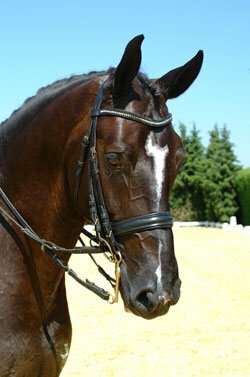 Verdi is a KWPN Warmblood by Osmium (by Ferro). He is a dark bay gelding and is born in 2002. Verdi is a wise old soul, although still young he gives you the feeling that he already knows more than you. He is a cuddle bug in the stable and wonderfully easy to work with from the ground. Unfortunately I think this kind character has been taken advantage of in the past and I get the feeling that he has been bullied. I don't know anything about his past so this is purely my own opinion. He is a compact, strong horse and sometimes when he panics he can get extremely strong. This is again where I'm blessed with Chris as he is a specialist in dealing with horses like this and is teaching me every day how to deal with this side of Verdi. Now that I'm starting to really get a feel for riding him every day is super exciting to see what I will discover with him and about him. Curious to see what the future holds!